There’s just so much to do at Walt Disney World during the Holiday season. In addition to special parades and entertainment, dazzling decorations, holiday treats and themed fireworks in the parks, there’s lots to do at the resorts and Disney Springs too. So let’s get started – it’s going to take a while to tell you about it all! We will update the page with 2019 Christmas Holiday Activities and Events Information as the information is released. Below is information for the 2018 Christmas Holiday season. 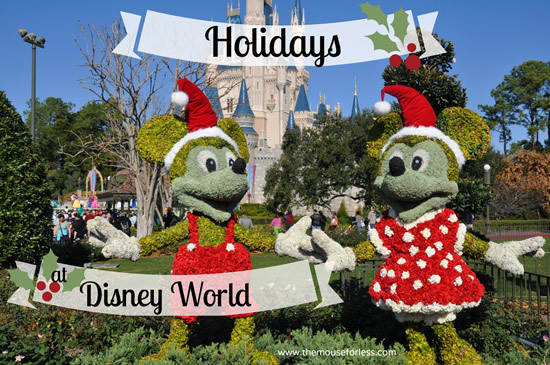 The week between Christmas and the New Years at Walt Disney World Resort is not for “first-time” vacationers, those who think it’s just about the rides or those who do not like crowds. That being said, it can be a most wonderful time of the year – if you plan ahead, know what to expect and come mentally prepared for the challenges. A very crowded Main Street USA in Magic Kingdom. For the past few years, Magic Kingdom park in particular has had to close its gates due to capacity crowds the week between Christmas and New Years. In addition, the Transportation and Ticket Center Parking lots that service the Magic Kingdom have, on occasion, reached capacity. Guests arriving at the toll plaza of the Magic Kingdom Park on such days are then directed to alternate parking at Epcot where they have the option to park and then use Resort transportation (monorails and/or buses) to return to Magic Kingdom. Parking at all of the monorail and Epcot area resorts is severely restricted beginning a few days prior to Christmas and continuing until after the New Year. High levels of traffic on New Years Eve night typically cause road closures and traffic pattern changes around property. Tips for handling crowds at particular parks or during particular times during the holiday period can be found throughout our holiday guide. Those who would like to avoid the crowds as much as possible can still take in much of what Walt Disney World has to offer during the holidays by visiting any time beginning early December, with some holiday offerings starting as early as the second week of November. You’ll find the dates for most holiday attractions noted in our guide below. The four theme parks and Disney Springs are the place to deck the halls! Walt Disney World Resort does that and plenty more this holiday season – the parks turn up the yuletide magic with shows, thrilling spectaculars, beloved characters, yummy and festive holiday treats, and theme parks and resort hotels all aglitter with holly, jolly decorations. Click on each link to learn more about what each park does for the holidays. Accompanied by a holiday host the Holiday D-Lights Tour has a little of everything. Visit Epcot theme park for a performance of the inspiring Candlelight Processional, a retelling of the Christmas story brought to life by a 50-piece live orchestra, mass choir and celebrity narrator. Travel to Magic Kingdom theme park to admire the majesty of Cinderella Castle, which appears to be a crystalline ice palace, courtesy of some very special lighting. Also visit the the Decorating Support building and learn what it takes to transform the entire destination into a winter wonderland and enjoy a light, holiday buffet. Disney’s Yuletide Fantasy Tour takes guests behind the scenes at Epcot, the Magic Kingdom, Disney’s Hollywood Studios and the Grand Floridian to learn how holiday Magic is created at Disney World. You’ll also get to visit the Holiday Services warehouse where holiday decorations are stored. To reserve either tour, call (407) WDW-TOUR. For more information on the holiday tours, visit our Disney Backstage Tours & Experiences page. Several Walt Disney World resort and park restaurants will offer special holiday dining from mid-December through early January. Holiday pricing will be in effect during these periods which means higher than normal prices at some restaurants. Reservations should be made well in advance and are available 180 days in advance by calling 407-WDW-DINE or going online. 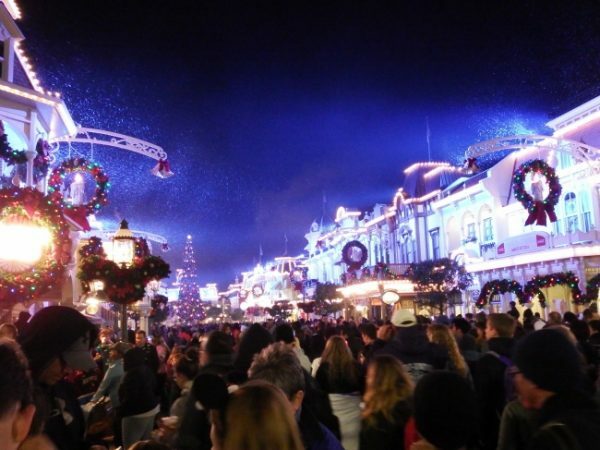 As it gets closer to Christmas, Disney may open additional seasonal venues in the parks. Special holiday treats can be found throughout Walt Disney World resort during the holiday season – from snack carts, to bakeries and confectioneries, to Quick Service and Table Service restaurants and even at resort and park gift shops. Check here for a full list of restaurants offering Christmas Day dinner. During the holidays, many Walt Disney World Resort quick-service restaurants issue dining receipts with a coupon for 20% off merchandise at select shops during hours before 1 p.m. While coupons have an expiration date, they do not have to be used the same day they are issued. Coupons are not valid on some merchandise, including alcohol, tobacco, Disney ticket media, periodicals, postage stamps, digital & video cameras, personalization, DVDs, CDs, and Disney Gift Cards. Holidays at Walt Disney World Resort Hotels are a huge part of the fun you can have at Disney during the Christmas season. They include gingerbread displays, train exhibits, treat shops, sleigh rides, and more. 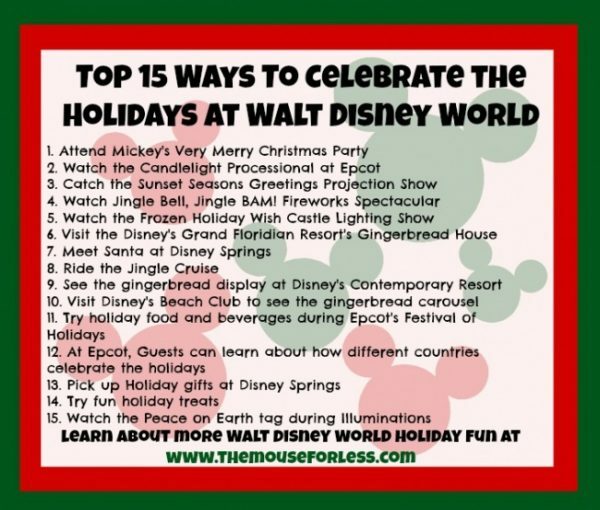 Below are listed a few of the “can’t miss” holiday displays around the resort hotels. Grand Floridian – Visit this resort to see a life-sized gingerbread house where guests have the opportunity to purchase a gingerbread “shingle” from the window of a gingerbread house! There is also a massive Christmas tree dominating the lobby of the resort. Wilderness Lodge – The Wilderness Lodge celebrates the holidays in Florida by making guests feel like they have been transported to the snowy northeast. Cozy up to the fireplace in the lobby and take in the gorgeous Christmas tree and garland around the resort. Yacht and Beach Club – These 2 resorts have gorgeous lobby decorations including a moving carousel made out of gingerbread and a miniature village complete with train that has been touched with some Disney magic. Boardwalk – The Boardwalk always has a unique gingerbread creation. The bakers at Disney let their imaginations run wild and create something fun every year. Contemporary – The Contemporary Resort has a cool Mary Blair (the design genius behind “it’s a small world”) gingerbread display. There is a treat stop where you can get your holiday sweet fix. You also won’t overlook the giant tree out in front of the resort decorated with massive decorations. Christmas Day religious services are generally offered at the Contemporary Resort in the Fantasia Ballroom. The Contemporary parking lot, as well as the Polynesian and Grand Floridian lots, are restricted for parking during service hours and attendees are advised to use resort transportation via the resort monorail or Contemporary boat dock or walkway from the Magic Kingdom. Every year a great selection of holiday merchandise and special offers are offered throughout Walt Disney World Resort and run the gamut from special holiday makeovers, holiday ear hats, trading pins, special holiday gift tins and candy treats, and much much more. Notable items will be mentioned here as they are released. Guests can celebrate the holiday with a spectacular In-Room Celebration at your Disney Resort hotel! Guests should be sure to set up the holiday surprise of a lifetime in the comfort of your room with an over-the-top, personalized welcome. Consider adding even more cheer to your room with the separate purchase of a beautifully designed Christmas tree or personalized stockings. To learn more about this and other In-Room Celebrations, please visit Disney Floral and Gifts online or call (407) WDW-GIFT or (407) 939-4438. In the past DVC members have enjoyed a special members-only event for the holidays at Epcot. In 2018 that event has been replaced by Moonlight Magic events throughout the year. There is a Holiday Dinner scheduled for Christmas Eve at the Contemporary and a New Year’s Eve Party scheduled at the Contemporary. Keep your eyes and ears open for other special DVC events. From celebrations in the theme parks to an upscale dining experience and dancing on Disney’s BoardWalk, take your pick of how you want to ring in the New Year. See our New Years Eve Events page. To make arrangements for a holiday vacation at Walt Disney World Resort, guests can call the Disney Reservation Center at 407/W-DISNEY, or consult with The Magic For Less Travel.